In an unexpected move, given its makers much-publicised dislike of Wikipedia, the online version of the Encyclopaedia Britannica has gone all wiki on us and installed an online editor on its site. These changes will be similar to Wikipedia in that any registered user can edit, change and amend an entry to their liking. The big difference, however, is that the editor’s name will be included at the bottom of the article. 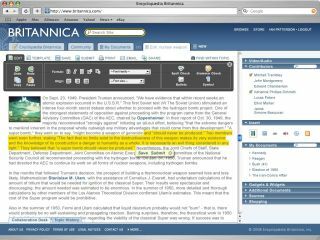 Encyclopaedia Britannica has been online since 1994, and this is one of the major changes to the site in its 14-year tenure.